Happy Monday! Whew....I was hoping my muse was not still on vacation - I haven't stamped in over a week, and didn't bring any supplies with me while I was gone...I know SHOCK! 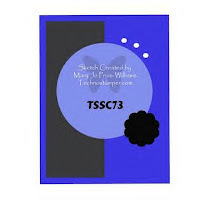 I've combined Kitchen Sink Monday with MJ's TechnoStamper Sketch Challenge for this week. 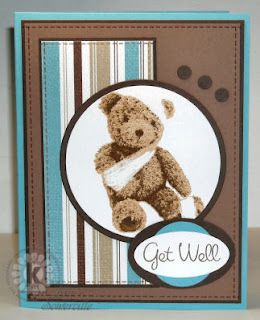 I stamped the Get Well Teddy from Kitchen Sink Stamps in Caramel, Caramel, Close to Cocoa then Chocolate Chip on White card stock, cut with Nesties, layered on a Chocolate panel. I only stamped a portion of the sentiment in Chocolate Chip, punched with the Large Oval Punch, layered on a Baja Breeze 1-1/4" circle, then the Chocolate Chip White Oval panel. I used the Drywall Stitching on the Parisian Breeze and Close to Cocoa Panels. Don't forget you still have time to enter the KSS Challenge for this month for your chance to win great products from KSS. You can save 10% on all your purchases at Kitchen Sink Stamps by using discount code LISA10KSS at checkout. Fabulous colors and layout for this precious get well bear!! What a delightful card!! This is just so very adorable, Lisa! Love your little bear! very cute card Lisa! Glad to see you back and hope you had a fabulous vacation, looks like you did! Wow! Those colors are sure to cheer anyone up! I absolutely love aqua and chocolate together. Fabulous take on the sketch. Beautiful! Isn't that such a fun stamp. Just darling. I love this card. Would certainly cheer me if I was sick. Thanks for playing along. How sweet that little teddy bear is! Just LOVE him! AND, he is perfect in this sketch. As always, your card is fabulous! Your card is fantastic as usual!! I love the sketch you used. Great colors and paper, too! Wow, your teddy looks like a photograph! Love the color combo, too! Great card, Lisa!